When Lauren of Crazy About my Baybah needed last minute cupcake toppers for her son's birthday, she got creative with a bag of marshmallows and made these easy stormtrooper cupcakes. Not only are they adorable, but completely edible. Move over, paper toppers, and make room for the marshmallow troopers! 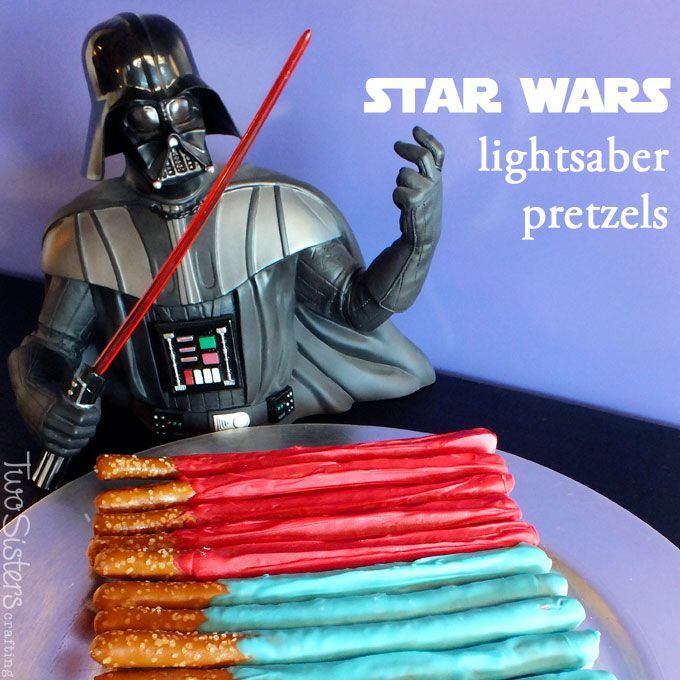 In honor of Star Wars Day, Laurie from Two Sisters Crafting created a batch of these colorful lightsaber pretzels. Check out her tutorial so that you can make lightsaber pretzels as well, whether it be on May 4th, to celebrate a viewing of the Star Wars films, or for a Star Wars birthday party theme. What better way to wash down those lightsaber pretzels than with some thirst-quenching water? But since we're celebrating Star Wars, plain old water just won't do. After all, if the pretzels are lightsabers, shouldn't the water be Star Wars-themed as well? Mimi, of Mimi's Dollhouse shares a Star Wars party that featured her creative printables, one of which is this fantastic label for turning ordinary H2O into "Luke Skywater." Who doesn't love using labels to turn ordinary party food into extraordinary edibles that fit perfectly into your party theme? Well, that's exactly what Penny of Penny's Parties did when she made these Yoda Soda and Vadar Ade beverage dispensers for this Star Wars birthday party. Drink up, young Jedis! As much as we all love creative, themed party foods, it's also very easy to equally love the idea of just ordering up some pizza delivery. Well, Sarah of Pretty Providence shares a way to do both with this clever "Jabba the Pizza Hutt" that was served at her nephew's Star Wars birthday bash. When Sarah Short of Short Stop Blog wanted to celebrate Star Wars Day (May the 4th) with her kids, she created a menu of simple, fun, Star Wars themed food. Included on her menu was this awesome creation of carbonite jello. Check out her ideas and make some Han-Solo-suspended-in-gelatin of your own -- sure to be a hit at your kids' Star Wars party! Another gem from Penny's Parties are these adorable Wookie cookies! Serve them at your Star Wars party, and I'll bet no one will resist these "chewy" delights. Jenae of Paintbrushes and Popsicles shares how to make these adorable Princess Leia cupcakes. 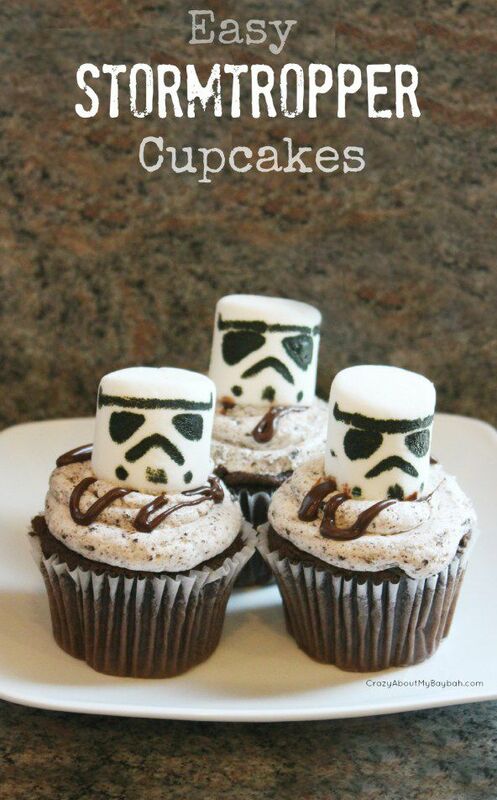 Check out her recipe to make these for your own celebration of all things Star Wars.